This bracelet is shown with an add-on Birthstone Dangle. 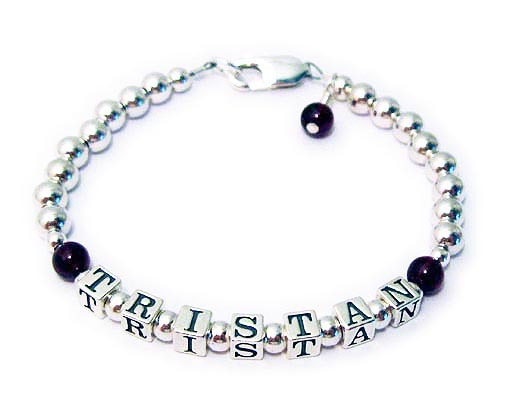 A 1-string bracelet is shown with garnets (January Birthstone). You may have up to 5 strings with this design and pick one or more birthstones. It is shown with an add-on January Birthstone Dangle. You have lots of options during the ordering process below. This is a beautiful real gemstone bracelet for mommy! Up to 9 letters are free PER STRING. Additional letters are $3 each. If you have questions or would like to further personalize this Gemstone Bracelet call or text me 615-490-2177 with questions or to place your orders.